Do you love to take on new tasks and responsibilities? Do you enjoy the fulfillment, appreciation (and even the glory) of reaching your goals, getting results, ensuring that things happen…. Perfectly? When we are passionate about what we are creating and doing this spirit-infused energy carries along in the rapids of the initial rushes of enthusiasm. Yet, when the first flush of fulfillment subsides, the calmer waters also encourage us to look for the next growth destinations. Is there the time, the space and the cash-flow to do it? Often we just do it ourselves at this stage, rather than engage the service and energy of another. So we flow on… putting in more and more time, love and energy to compensate as the river of abundance widens. And what happens? So many of us lovely, entrepreneurial, creative people are walking around right now with far too much on their shoulders. We have been paddling to fast for too long and our bodies and minds are feeling it. Especially at the end of an Ibiza summer! This is increasingly stressful, creating emotional and physical tensions that, when they weigh too much, deplete our energy and impede our creative flow. If we are overburdened, we tend to feel easily overwhelmed, we may not be able to see the wood for the trees, or may feel that no-one else can help us if we ourselves cannot think and feel clearly. 4. Ask yourself – how much is THIS worth to me? 6. And now, check within yourself, do you have any resistance to letting go? 7. Describe the qualities of the perfect person, to assist you in successfully filling this role. 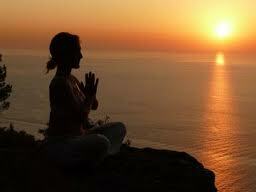 As an entrepreneur myself, a Life and Wellness Coach, Yoga Teacher and Wellbeing specialist…. I should be able to manage my life perfectly…. Right? Well…. That would be in a life that never grows, or moves forward in anyway. Whenever there is motion, there is growth and evolution and change. This naturally creates new stresses and tensions as the opportunities arise. New tasks and challenges mean that every once and a while, we all need to sit down, to Just Stop! and to reflect, with the help of a professional coach, or trusted mentor or teacher, to map out our life and take stock of what really matters to feel purposeful and passionate about what we are doing. So as a Coach and a teacher, I invite you to trust yourself to decide if following these tips feels important in your life right now, to help you rebalance and reharmonise: right! How do Pomegranates give your body such nutritional love? 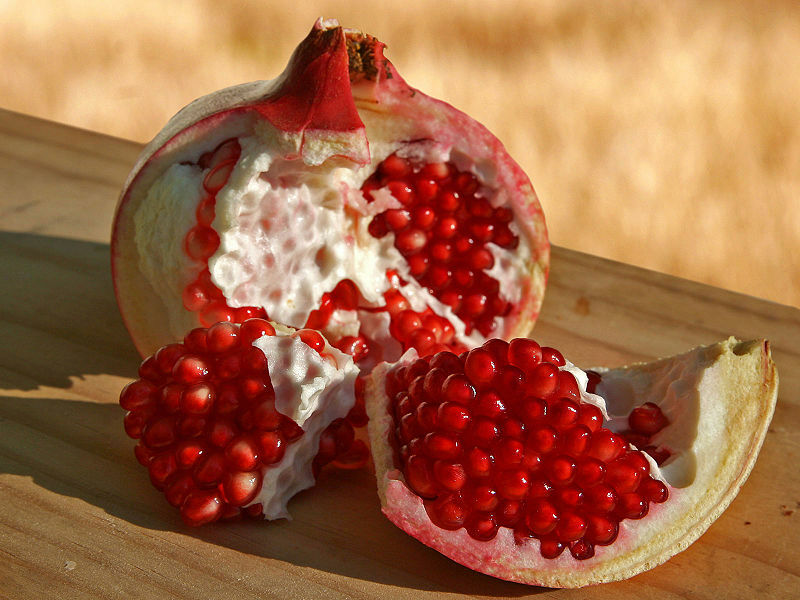 Perk up the inner-passions and ease into winter with the wonderful POMEGRANATES we have on the island!! This time of year, we can pick them off the trees here in Ibiza and use them to sprinkle over salads like festive jewels… or Juice up for a MASSIVE vitamin C boost full of ANTIOXIDANTS and delight in the deliciousness of the colour of LOVE. Persians believe that the Pomegranate was the forbidden fruit that Eve plucked from the tree of knowledge and its’ health-giving qualities certainly make this seem possible! It will sharpen your mind and gift you with clarity. Ancient Egyptians buried their dead with Pomegranates for eternal life and it is traditionally for good luck. * And eating the seeds can even be a natural viagra! https://ibizaretreats.com/wp-content/uploads/pomegranate1.jpg 600 800 Ibiza Retreats https://ibizaretreats.com/wp-content/uploads/2018/02/ibiza-retreats-trans-300x138.png Ibiza Retreats2012-10-05 11:11:332012-12-03 13:52:08How do Pomegranates give your body such nutritional love? Enjoy fresh seasonal salads to nourish yourself easily. Harmonise with the changing seasons and look around you in Ibiza for figs on the trees, add pomegranate seeds and fresh goats cheese. 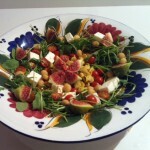 Make a seasonal salad to bring Autumn sunshine into your life…. look for local produce to get in synch with your body’s natural rhythms. 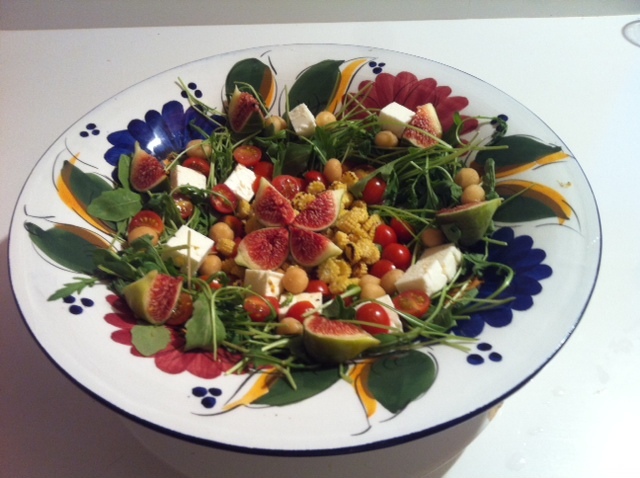 Here is an amazing seasonal salad full of figs from Ibiza, fresh goats cheese, fresh leaves – explore what is fresh on the counters in your farmers markets, fruit stands and direct from organically growing suppliers. Your body LOVES to eat seasonally and this will be exactly what your organs are asking for. Add adzuki beans to soups for your kidneys and fresh ginger to ward off seasonal-change colds.